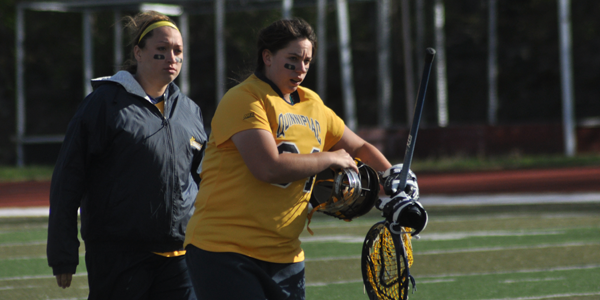 A day after three Quinnipiac women’s lacrosse players were honored with end of the year conference awards, the No. 2 Bobcats began their title defense by taking on No. 3 Monmouth University at Sacred Heart in the Northeast Conference semifinals. However, the championship dreams were ended after the first half for the Bobcats as Monmouth defeated them, 9-4. No. 3 Monmouth will now face No. 4 Mount St. Mary’s on Sunday at 1 p.m. at Sacred Heart University in Fairfield, in the NEC championship game. This marks the first time since 2007 that Quinnipiac or Sacred Heart will not play for the conference tournament title. It will also be a rematch of that 2007 NEC championship when Monmouth beat Mount St. Mary’s 9-8. Monmouth’s strategy was clear early on; keep possession as long as possible. They wanted to stay clear of the Bobcats dangerous offense that averaged 11.33 goals per game, which was second best in the conference. They did just that, holding Quinnipiac to a season-low four goals on the afternoon. The Bobcats had 15 turnovers on the day compared to 13 for Monmouth. Eleven of those turnovers came in the second half for Quinnipiac. Quinnipiac (8-8, 7-3 NEC) went into halftime with a 6-4 deficit and couldn’t get anything done in the second half as freshman goalie Katie Donohoe stopped all six shots on goal in the half. Donohoe finished the game with nine saves while Noelle Martello stopped seven-of-10 shots faced. Martello was subbed in for freshman Samantha Titls to begin the second half as Tilts allowed six goals while stopping three shots. The Bobcats also struggled on the draw today, winning just six-of-13 face-offs. Quinnipiac’s Devon Gibney came into the game second in the conference in draw controls per game and didn’t win a single draw. This worked perfectly for the Hawks gameplan as Sam Lillo was able to win five draws for Monmouth and allow them to set up their offense throughout the game. Senior Marissa Caroleo finished with two points in the game off of a goal and an assist. She finishes her Bobcat career as a two-time Northeast Conference Player of the Year award winner as well as the Northeast Conference Rookie of the Year award in 2008. She is second on the all-time points list at Quinnipiac with 174 points.